This is in book form let alone on the Internet but I’ll try to give you a quick run through here. 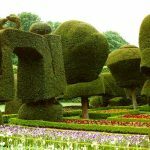 Although the Seventeenth Century is seen as the Golden Age of topiary clipped trees and bushes can be traced back to the Egyptians and the Ancient Romans. See the section on the Roman Consul Pliny the Elder on the Home Page. Although gardening was popular amongst the upper classes the actual physical work was done by the slaves in many cases. The one who looked after the ornamental garden (the Topia) was thus known as the Topiarus. Many writers think that Egyptian, Syrian Greek or Jewish slaves were the first people to introduce the art to the Romans. The Persian Empire was also known to have splendid hedges with clipped Myrtle and the ancient Egyptian garden often showed a formal symmetry as can be seen from the many surviving paintings. After the fall of the Roman Empire in Italy the monks kept the art of topiary alive in the cloisters of their monasteries. In the Renaissance the wealthy families who were often as devout as they were ruthless paid to have elaborate gardens in their villas based on the learning of these monks who took their inspiration from the writings of the Ancients. The poet Petrarch, amongst others, emulated Virgil in writing about formal landscapes for instance. In 1467 a monk called Francesco Colonna published a book called “Hypnerotomachia” which was an allegorical work set in visionary gardens and this had a profound influence on subsequent Italian aristocracy and their gardens. 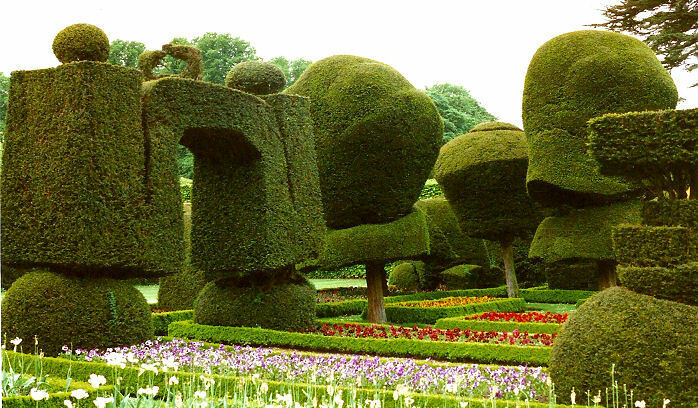 Mazes and labyrinths were popular in Britain from after the Norman Conquest but it was in the Seventeenth Century that topiary became part of the formal landscape. As with all fashions, however, this was to be fairly short-lived as the mania for the Landscape style, made popular by such exponents as Lancelot “Capability” Brown meant that many formal topiary gardens were ripped up in the pursuit of open parkland. Fortunately it never entirely died and small cottage gardens continued the art as the British are especially noted for their eccentricities. Another revival came in the 1830’s when such gardens as “Mon Plaisir” in the grounds of Elvaston Caste in Derbyshire were laid out as by now many people had begun to tire of landscape expanses. The Victorians developed topiary, as they did all other aspects of garden design and machinery and of course it continued to thrive in the Twentieth Century with the efforts of Major Lawrence Johnston at Hidcote Manor in Gloucestershire, Vita Sackville West at Sissinghurst Castle in Kent and many others. …and long may it remain.